Smartphones are the new portable cameras—almost. 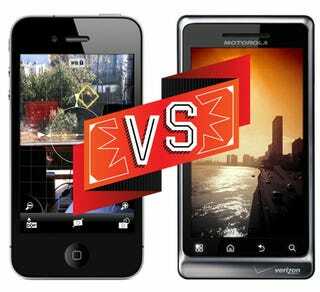 With these apps, though, you can turn your iPhone or Android handset into a true pocket camera killer. A little known camera app with all the standard trappings, like brightness, color tools, video recording, grids, anti-shake and a full-screen shutter, to name just a few. The killer feature, though, is distinct white balance, exposure and focus adjustment. With such fine control via touchscreen, this app can actually make your iPhone 4 more powerful than a low-end point and shoot. $3, iPhone. You don't need to self-identify as a hipster to enjoy this camera filter app—you don't even need to be a hipster in denial. The faux nostalgic aesthetic can wear on you after a while, but the filters are generally top notch, and routinely return stunning and unexpected results. The "lens" and "film" and "flash" combinations are nearly endless. $2, iPhone. • Colorsplash: Adds color to specific patches of a photo, a la Sin City. $1. • Instagram: Like a free Hipstamatic, with a social component. The dealbreaker is its oddly low 600x600 output resolution. • Pano: Seamless, huge panoramas. Awesome. $3. • Digital Focus: Its specialties are a simulated depth of field effect and a tilt-shift setting, which aren't totally convincing, but manage to look cool in their own ways. $1. With Vignette you get those wonderful artsy effects your friends love and a ton of straight shooting options that'll make you leave your Point and Shoot at home. Snazz up photos with 68 different effects (yes, you can get vintage-style and toycamera-style options along with other awesome effects) and spice things up with 56 unique frames. Vignette's straight shooting options cover all the major bases too: fixed focus, fast shot, steady shot, self timer, etc., so if you want to create your own style, by all means. The only downside is that taking higher megapixel shots requires buying the Pro version and the app settings can get a little messy (though the camera UI is so excellently simple a 5 year old could handle it). Free, Android. $3.93 for Pro. Complete with your usual slew of effects, Camera 360 throws in sillier options, like funny and scenery modes, to round out a ridiculously comprehensive feature set. Really, Camera 360 packs as much stuff as you can possibly think of: HDR-style pictures, image stabilization, multiple flash/focus, various manual modes, and TONS more. The camera UI is not as polished as Vignette's but adjusting settings is much easier. There's also a rather neat option to compare the original photo with the after effects photo when you tap a picture. Free, Android. $3.99 for Pro. It's a fairly basic lomo FX/hipstamatic style camera but it's REALLY easy to use and processes the pictures REALLY fast. There's not too many effects available (ToyCam, Polaroid, Fisheye, SymmetriCam, and Andy Warholizer), but all of them are stellar. Free, Android. • Fast Camera: It's a really fast camera. Costs $2.83 though.